Today is my Son’s 13th birthday, I am blessed with two wonderful kids. At the time when I looked for a way out, the Lord reminded me how much they needed me and in turn I realized how much I needed them and more importantly we all need the Father. This entry was posted in Faith, Verse of the Day and tagged Bible Verse, Children, Children Of God, Christ, Faith, Freedom, God, Hope, Inspiration, Isaiah 54:13, Jesus, Kutless, The Father on September 9, 2014 by waynemali. 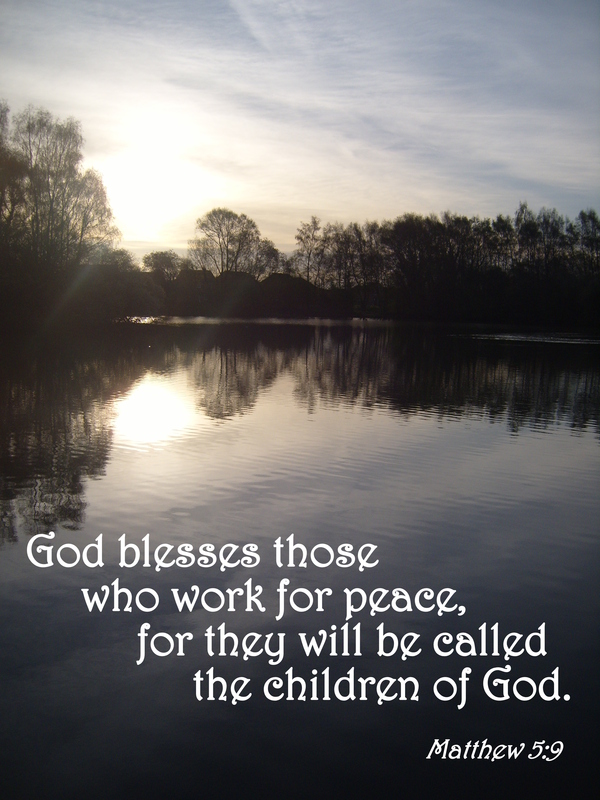 Peace can sometimes mean so many things, in our daily walks it can be hard to find peace and keep working for it, yet I find the Word of God brings peace to my mind when it’s in turmoil. 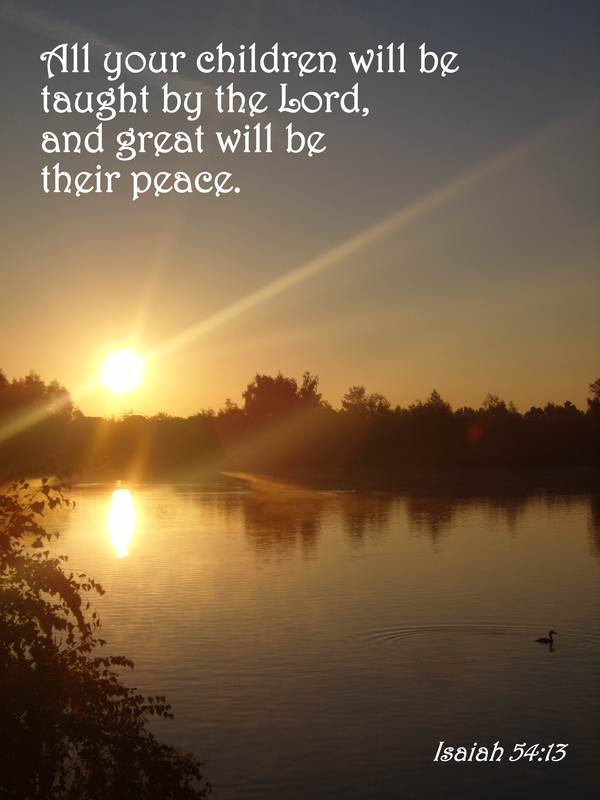 This entry was posted in Faith, Verse of the Day and tagged Bible Verse, Children Of God, Christ, Faith, Freedom, God, Inspiration, Jesus, Matthew 5:9, Peace, Third Day, Word of God on June 2, 2014 by waynemali. Two weeks ago I took my Son to our Church youth group Amplified for the first time, he used to go to the group for younger kids before it was closed, but as he’s now 11 and in September will move up schools, he’s eligible for the older youth group which I have been attending as part of the A.V. Team. Two weeks ago it was games in the local park, not the normal meeting at Church, so yesterday evening he came along for the first time. Well if you’ve seen my post “Alone In A Crowded Room” then you will know how hard I find it to mix with new people, so Ben is the same, he’s shy and quiet, not a natural mixer, like me he’s okay when he’s included, but not great at being forward. In regular Church meetings on a Sunday morning, he sits with the other from Kids Church, whilst most of the girls dance and sing along to worship, my daughter Eve included, Ben sits quietly at the side, not getting involved, when I see him from my camera position or indeed from my old seat, I see myself in him. Also he doesn’t like change too much, in fact he doesn’t want to move school, he told has last teacher at his primary school he does not want to go to secondary school, point blank he refused to go, they managed to convince him he has to, told him to see how it goes for the first few months, then they would speak with him after that, somehow they got him to agree. He met with a few of the kids at the park a few weeks ago, so he knew a few last night, but at times I could see him alone, but trying. When it came to worship last night, he stood up at the front with the others, I half expected him to stay seated at the back, but he moved forward and I’m certain I actually saw him clapping along with the music. In the social time after he stood alone a while, so I engaged in a game of table tennis with him, which he enjoyed, then he was joined by a group of others and seemed to be in thick of things, so I left him to it. By the end of the evening he knew quite a few of the other kids and had signed us up for the BBQ next Friday. I glad he’s making friends, many of these kids although older than him, go to his new school, I think it’s good for him to have some older friends he knows in his new environment who can help him. We helped tidy up and put out the chairs out of Sunday’s service, he got involved and didn’t complain even as it got late. Although he’s a quiet lad (unless he’s fighting with his sister) he seemed to enjoy it and I hope it will help him, both with his new school and shyness, but more importantly with his faith. I’m proud of how he handled it last night and proud of how he got involved, it may be a small step, but it’s a start. This entry was posted in Faith, Ramblings and tagged Amplified, Ben, Children Of God, Church, Everyday Champions Church, Faith, Friends, God, Inspiration, Jesus, Kids, Shyness, Son, Third Day on August 10, 2013 by waynemali. With a nice quiet relaxing Boxing Day, I decided to make a few alterations to my Blog, but unfortunately what I had planned is taking longer than expected. I’ve managed to get some of these completed but there is more to do, much more to get it looking and functioning the way I want it to. The main change for today is the addition of the My Favourite Posts page on the menu. The reason for this is, as the Blog has grown so much, since I started this back in October, many of my new followers will probably not have read some of my earlier posts, some of which I believe are the strongest that I have written, therefore I started with six of my favourites on the menu for easy access, obviously this may grow over time. If you have not read these posts, please feel free to take a look. I’ve also added some of the facts I’ve posted about me to the About Me menu. Over the coming days I intend to add a menu to catalogue my poetry and also revamp the Music For Inspiration page, but that is taking a lot longer than I anticipated. As you may have gathered from my posts over the last week, this Christmas has gone a lot better for me than I was expecting. Many of you have left me some fantastic comments on my more recent posts, I thank you so much for each comment and every like, they have all help to keep my spirits up and reinforce my faith. I dedicate Children Of God by Third Day to you all. This entry was posted in Faith, Ramblings and tagged Boxing Day, Celebration, Children Of God, Christmas, Faith, Friends, God, Jesus, Thanks, Third Day on December 26, 2012 by waynemali.